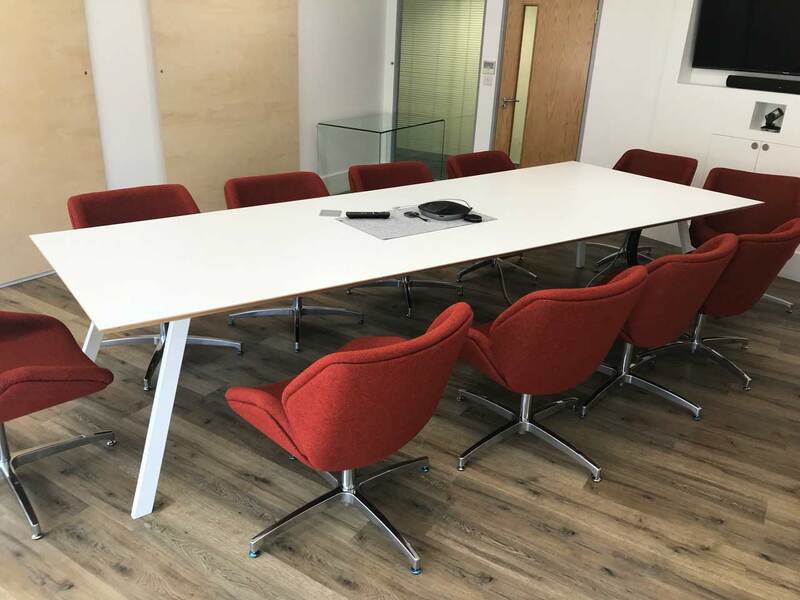 Our custom-built conference tables are tailored to whatever style and size you’re looking for, so whether you’re after a huge boardroom table, or a set of small restaurant tables, we’ll put together some recommendations to suit your space and requirements. We have access to a huge range of timbers and man-made stone surfaces. We also work with acrylic, steel, and glass. As each piece is custom built, you can choose any size, style, and finish. 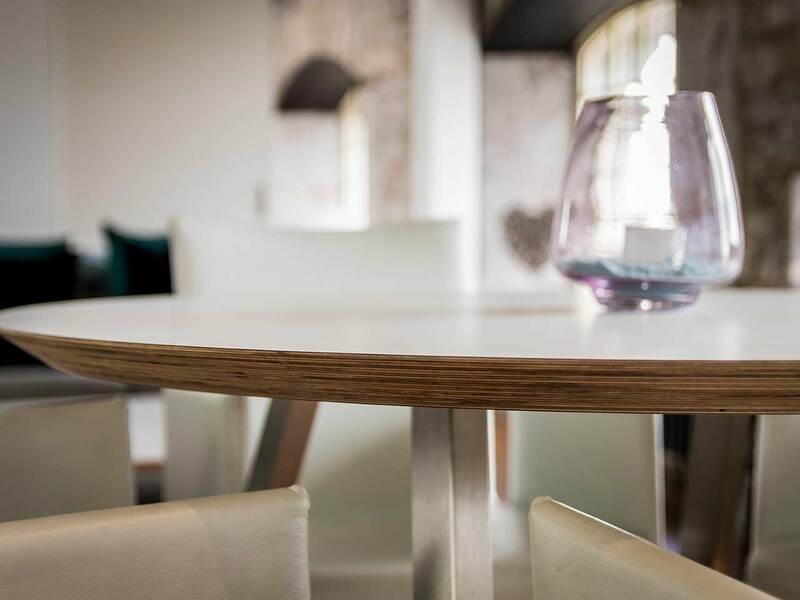 There are lots of possibilities including customised variations of our standard dining tables. So let us know what your requirement are and we’ll send over some suggestions that are tailored to you. Watch our video to see what makes Abacus Tables unique. 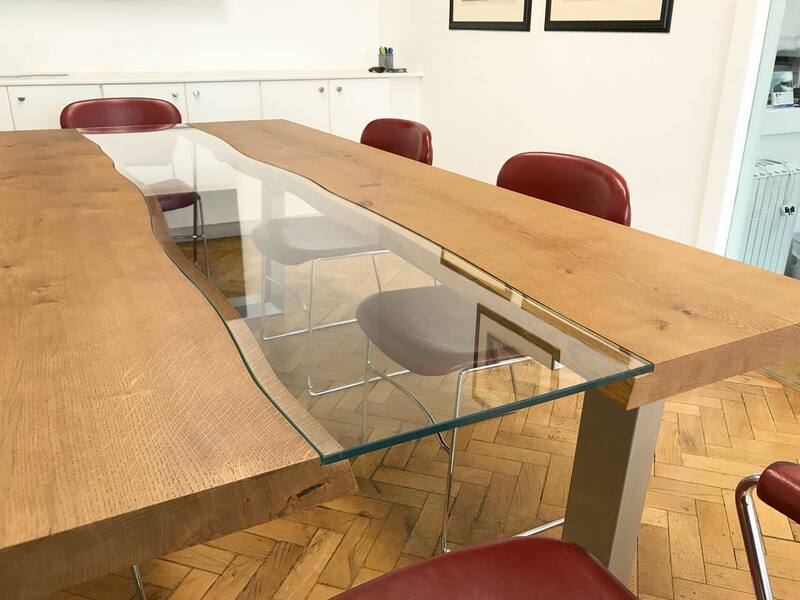 We have access to some of the largest slabs of timber in the UK, which are perfect for a large boardroom table. There are also some really stunning man-made materials available, all of which make beautiful large meeting table centre-pieces. 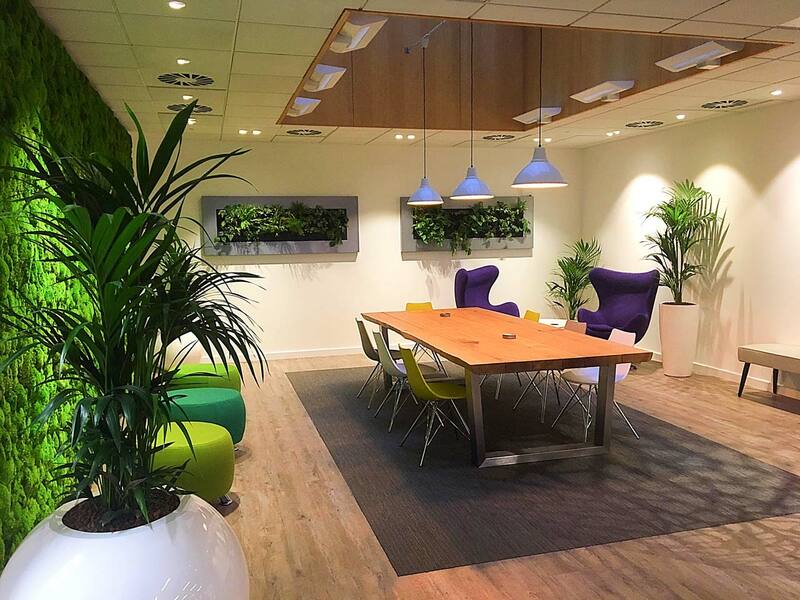 We’ll advise you on the best option to suit your space and requirements. 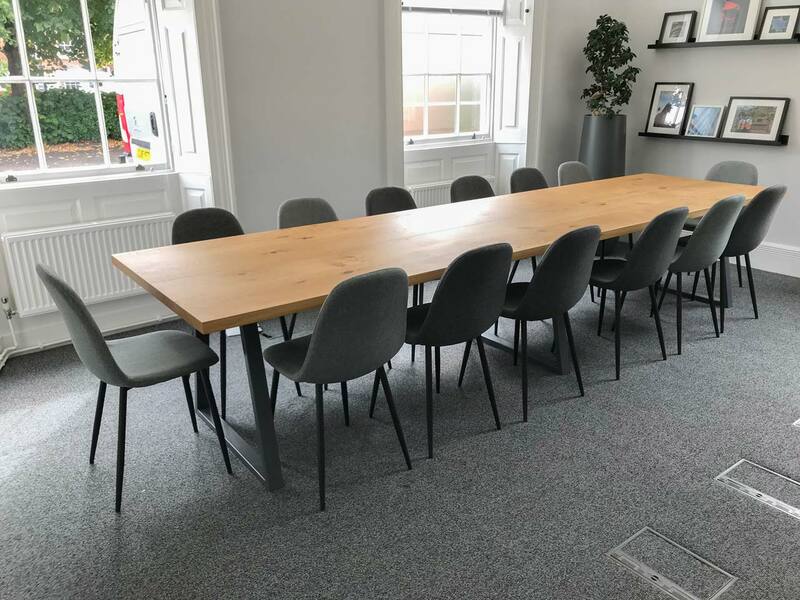 So If you’re looking for a large boardroom table, just let us know what your size and style you have in mind and we’ll put together some options for you. 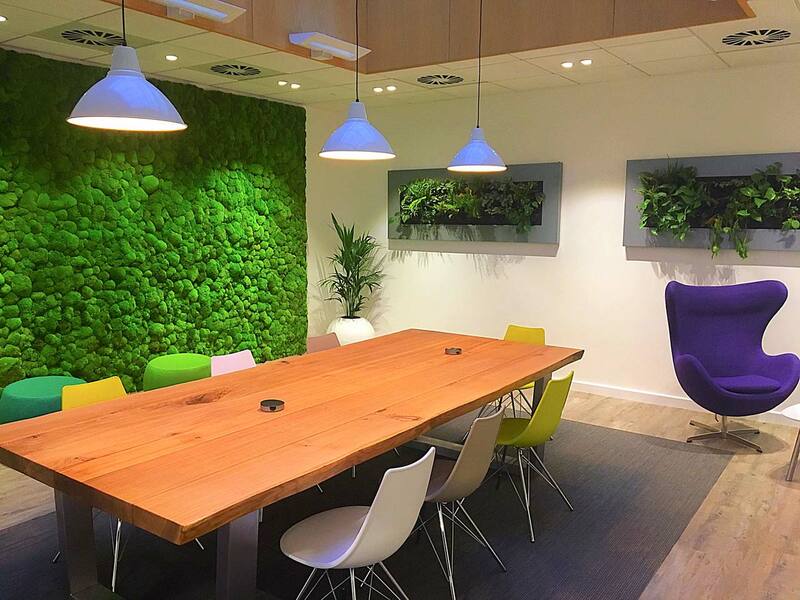 Benoy came to us looking for an extra long table for their newly refurbished meeting room. They loved the Piranha design, which normally goes up to 2.4m in length. So we adapted the design by adding an extra central leg, to maintain the distinct profile of the Piranha combined with the 40mm thick oak top. To give the table a perfect symmetry we made the table top in 2 equal-size halves, from wide oak pieces. Legs are finished in a matt grey powder coating combining nicely with a Natural finish oak top. 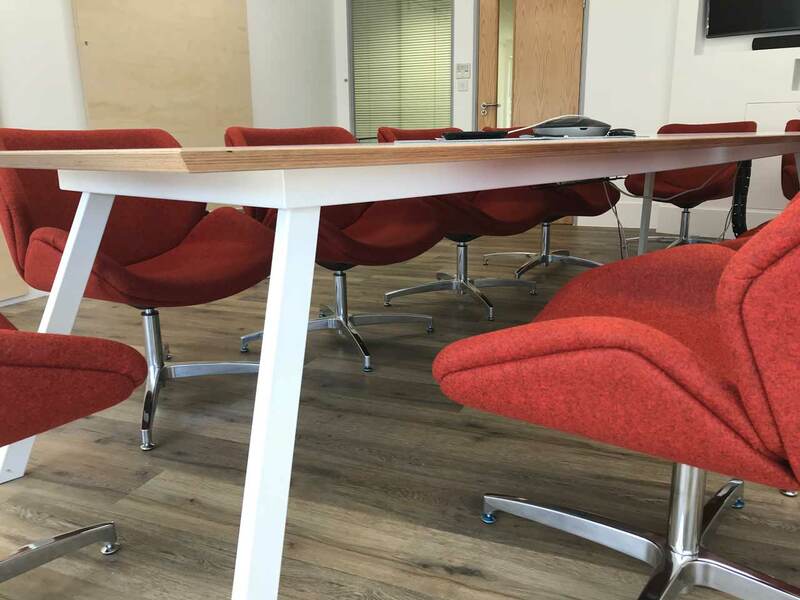 This conference room table was designed for a fashion company who spend a lot of time communicating by video conference to their branches around the world. So we designed the table to taper from one end to the other, so everyone seated around the table has an unobstructed view of their colleagues on the big screen at the head of the table. This minimal and very contemporary design is based on our Strata table, at 3600mm long and tapering from 1600mm to 1100mm end to end. There’s a removable thumb cap in the table surface for cables and a cable tray underneath to route everything tidily to the nearest power outlet. 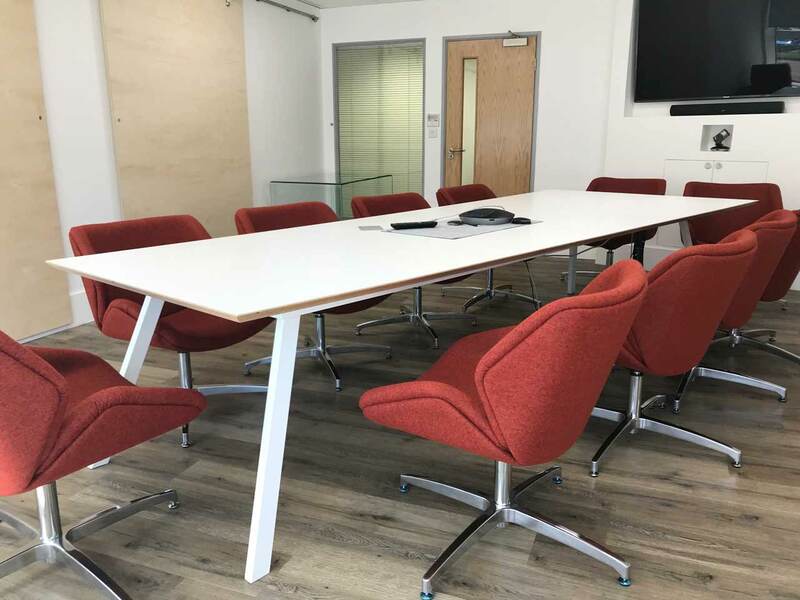 The top is a 25mm ply with durable soft textured Formica HPL (high pressure laminate) in Polar white, to match the powder coated Polar White legs and under frame in a matt finish. 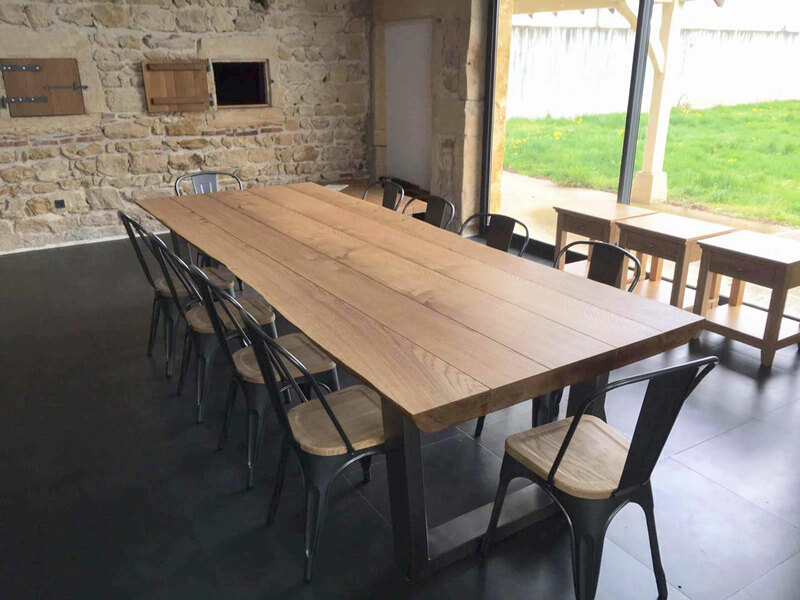 We can design the perfect commercial restaurant tables to suit your space. Choose from a variety of standard table top and leg styles, or we can custom design something specifically for you, based on your brief. 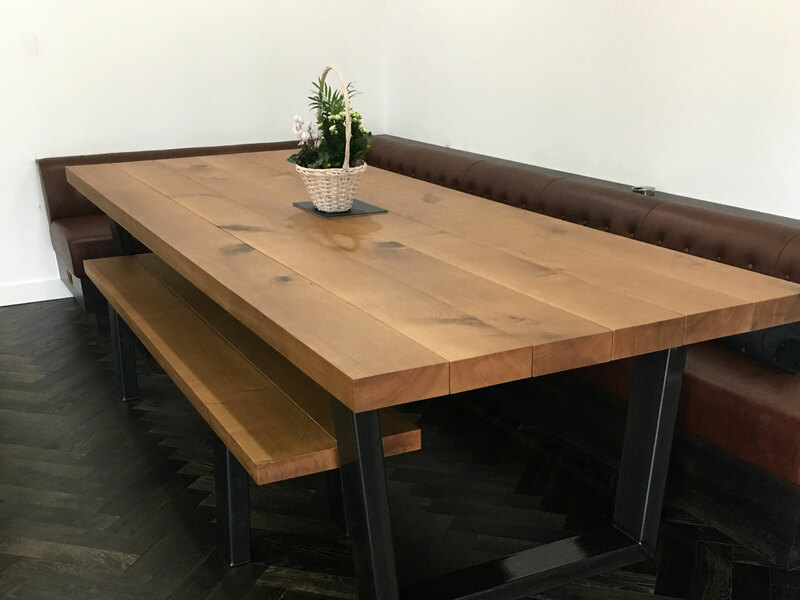 From solid wood restaurant tables to super stain-resistant man-made surfaces, we have a wide range of materials with various heat and stain resistant properties to make sure you get the durability you need to keep the tables looking good. We’ll be there to advise you about the best options for your space. 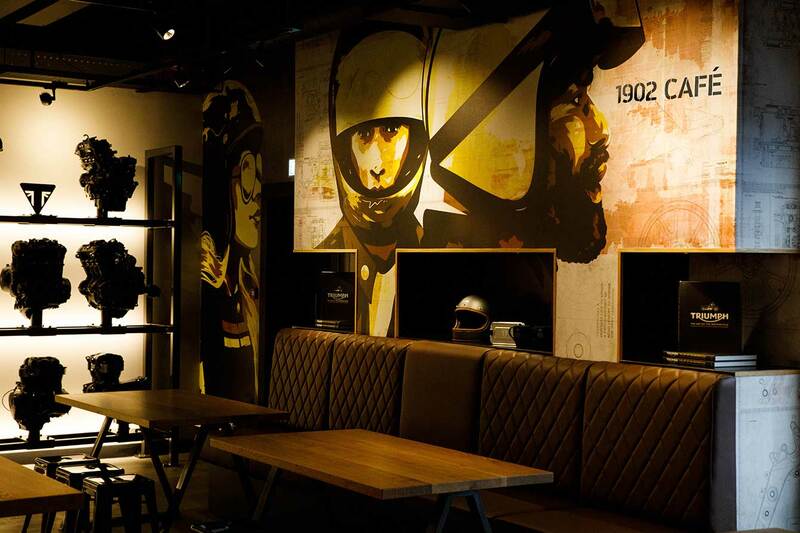 These industrial restaurant tables were specifically designed to suit the the prestigious Triumph Motorcycle brand. 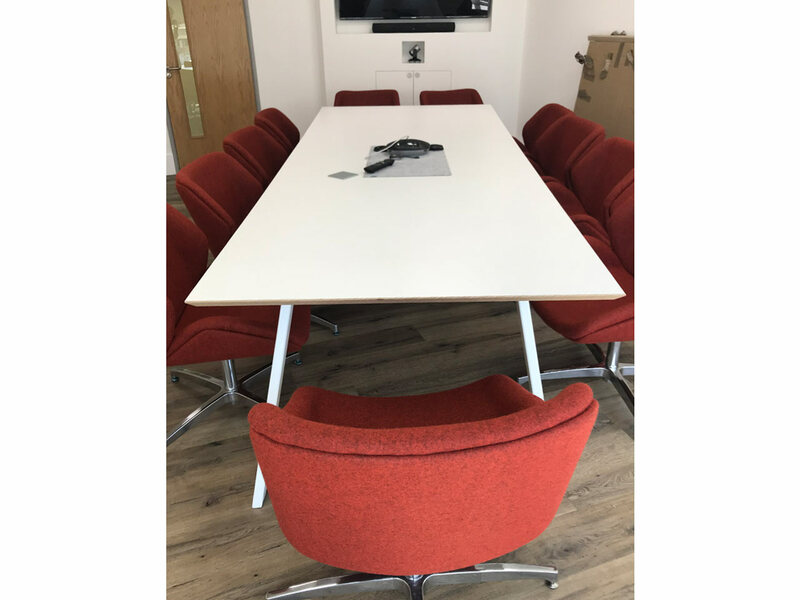 The architect for this project came to us with an adapted version of our Piranha table, he wanted the triangle of the legs higher at the top and wanted the legs to sit right near the ends of the tables, maximising the seating room between the legs rather than leaving space for a seat at each end of the table. 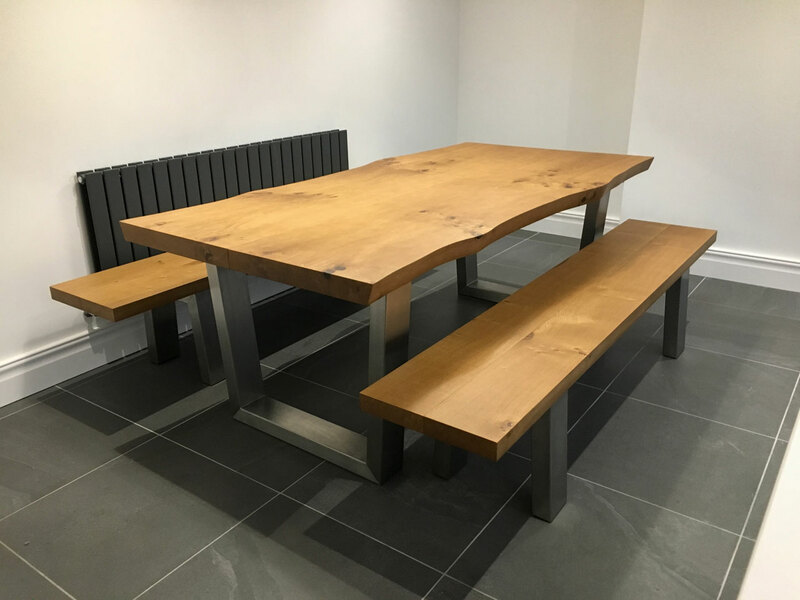 We adapted the support structure of the table top to achieve this (all hidden beneath the table) and produced a combination of dining tables for chair and bench seating and high tables for barstool seating. 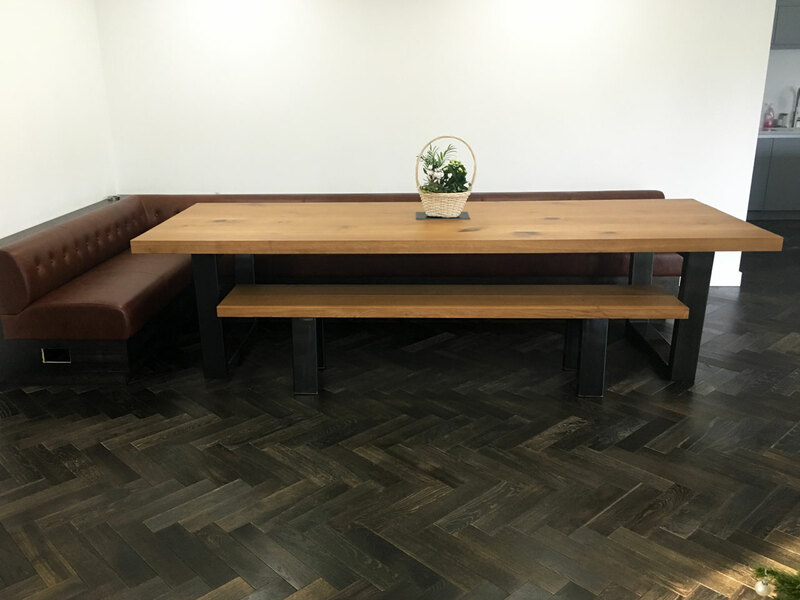 The tops are made from wide solid oak planks that’s 40mm thick, which have been jointed into single-piece tops with a natural oak finish (commercial grade so very durable and resilient to staining). The legs are 60 x 30mm mild steel powder coated in a matt grey. We make custom boardroom tables (or conferences room tables) of any size, and virtually any style. Choose from our selection of standard table designs, or if you’re after something bespoke just let us know the style and size you’re after, and we’ll design something specifically for you. Axa’s CEO wanted a striking centre-piece table to complete their major office refurbishments at their new London head office. 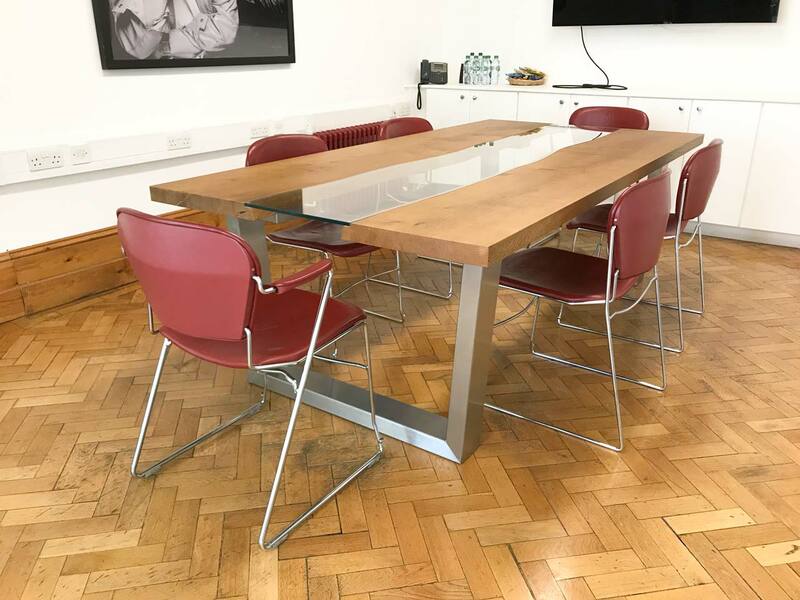 The brief was a big chunky table of the finest quality oak, to really be a point of pride for the company executives and to have an impact on clients they were hosting. As the photos show, the table had to come with integrated power points and USB connections. We recommended S-Box, which are a very high quality pop-up unit that hides in the table top. The intelligence of these units is that the pop-up mechanism works extremely smoothly and silently because of a patented counter-weight system, rather than a noisy and more problematic electric motor operation. 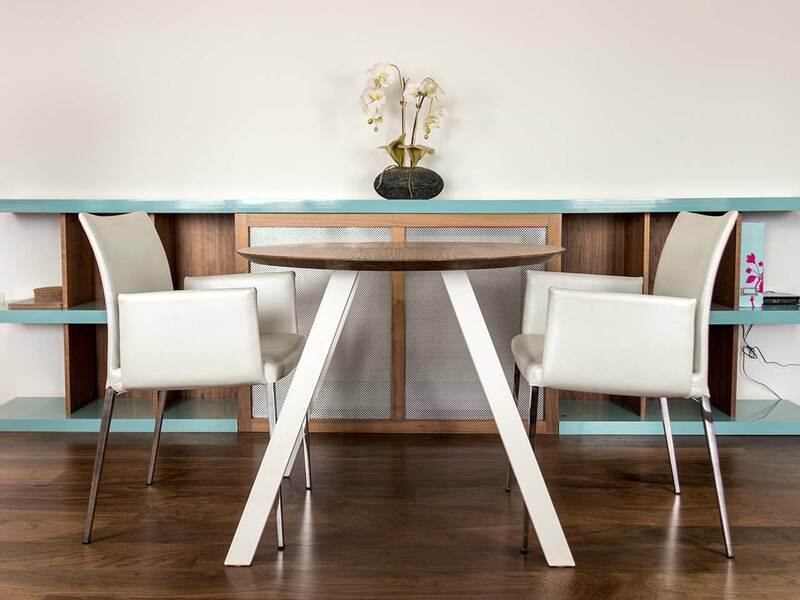 The engineered simplicity behind the S-Box made it the perfect fit for one of our tables. Here at Abacus, we specialise in live edge tables. 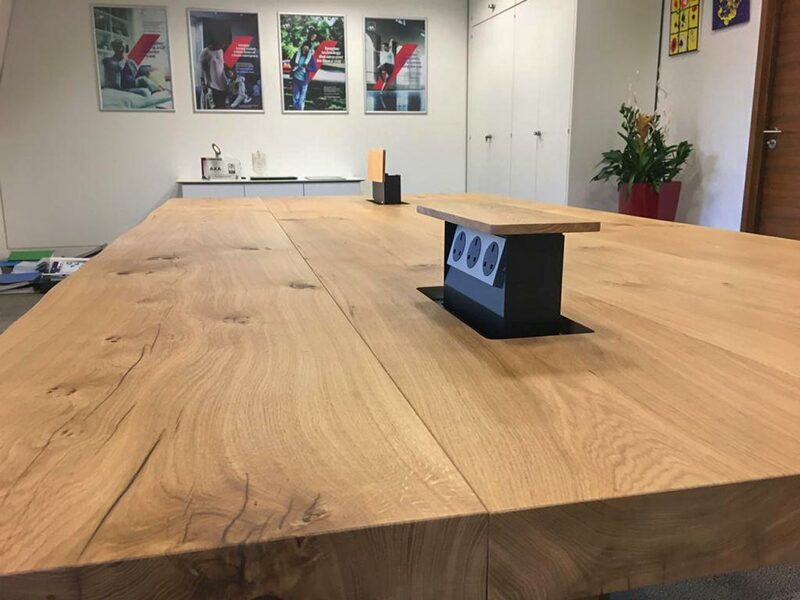 If you’re looking for a live edge boardroom table, there several option for the width of slab that we use, as well as the timber type and thickness. 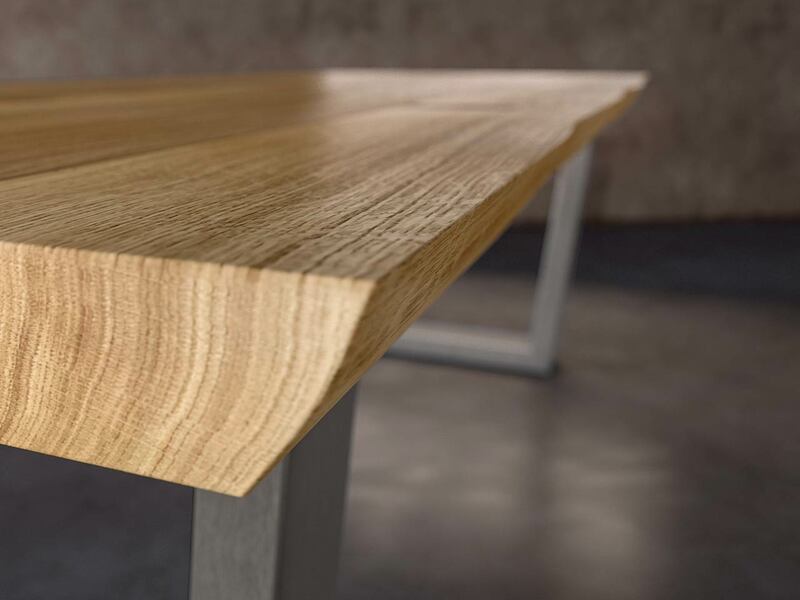 Whether it’s a live edge boardroom table, or live edge conference room table, It’s really important that anyone considering one of these big natural oak tables is fully informed about the quirks that come with this type of furniture. 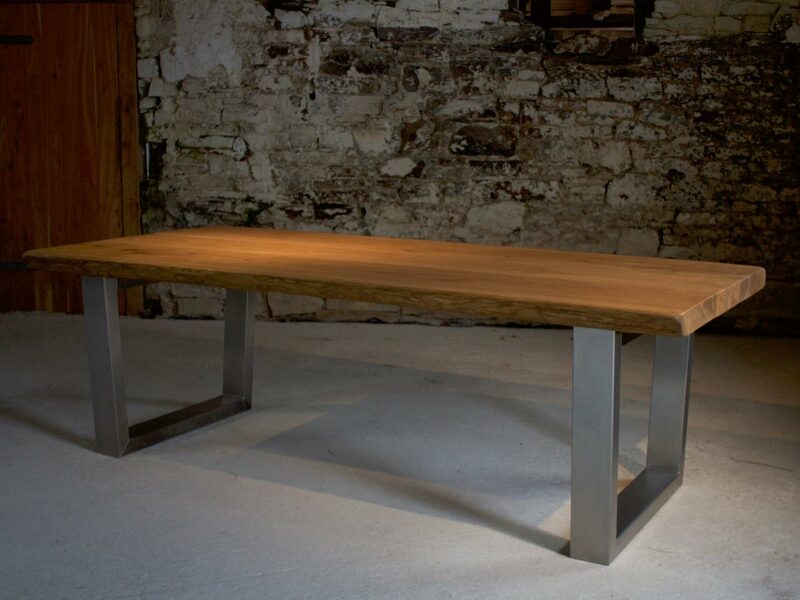 The River Table – This was a bespoke piece commissioned with a precise specification. The River Table uses 2 full-width slices of oak through a tree, with the live edges reversed and positioned down the centre of the table, rather than the outside. There is a clear 10mm thick toughened glass cover that in recessed into the centre of the table, custom-cut to follow the undulations and make an exhibit of the tree’s natural edges. We bought in special pieces of oak that had the natural edge curvature to suit this table and create the River effect. We also adapted the design of our Komodo legs so there was no visible support under the table top between the 2 oak pieces, giving the top a floating appearance. Movement, cracking, bending, warping… these are all a possibility with any large piece of natural timber. Some timbers carry much more of a risk of movement than oak, which has a mid-level movement coefficient. If you’ve read our website then you’ll know that our French Oak trees (technically know as “Boules”) have been slowly are carefully kiln dried to gently reduce the years of stored tension and ease their natural moisture content down towards the levels of your indoor home environment After buying boules of oak for many years I can confidently tell you that “kiln dried” does not guarantee that this process has been given the time and care that is required to product indoor furniture that will last. Nevertheless, there is no artificial seasoning process that can replicate the exact heat and moisture levels in your home throughout the year, especially the extreme heat and dry air of a centrally heater home in winter. Which means the oak in your table will be experiencing new conditions for the first 12 month cycle in your home and that means it may move, crack, bend… These are all possibilities regardless of how well seasoned the timber is. We do everything possible to minimise the risk and the degree of oak movement. Firstly, all our timber is subjected to a lengthy and intense drying process to make sure that the moisture content is as low as possible. 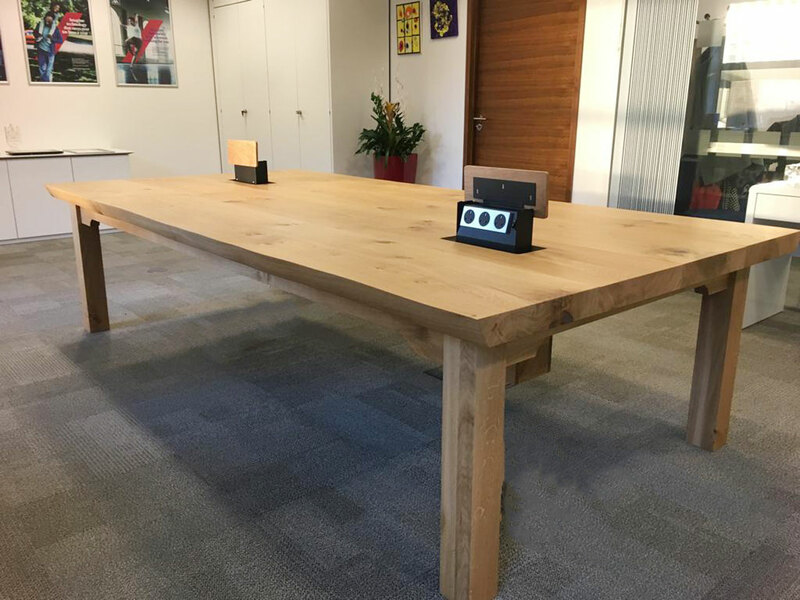 We also use our own specially engineered joint system that holds the table rigidly together whilst allowing the oak pieces to move independently from each other and the table legs. 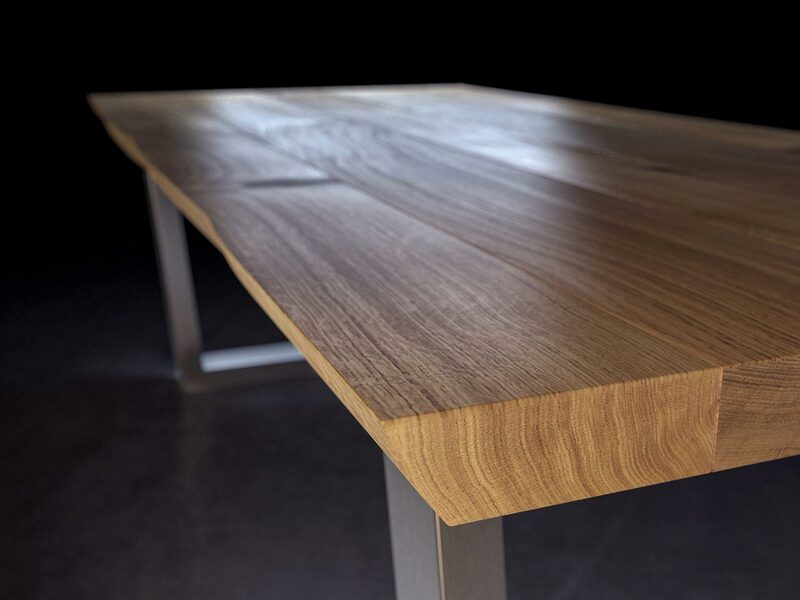 BUT, as wood if you are investing in a real oak table to not just look stunning, but retain its stunning beauty for many many years, it is absolutely essential that your table comes with an aftercare service to address any movement issues that arise within the first 12 months of settling. 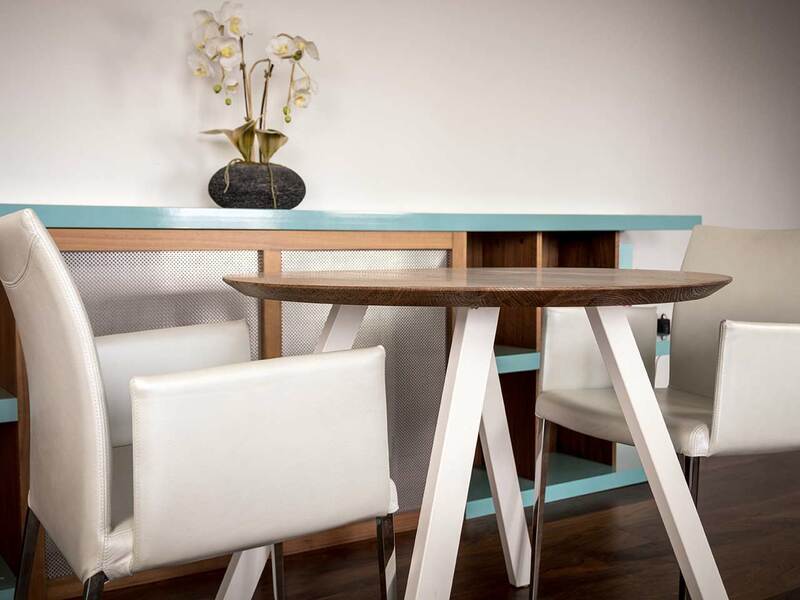 Providing this vital aftercare service is something very few other table makers are willing or able to do, so our promise to prove this service gives you a unique peace of mind that you can only get when buying a table from Abacus. Until recently we have used independent delivery and service companies to help us provide the aftercare that these tables need. But now we are delighted to introduce our own in-house Abacus installation and service team, operating nationwide with the equipment to address the settling issues your table might experience, without needing to take your table away or you losing a single day of use more than necessary. 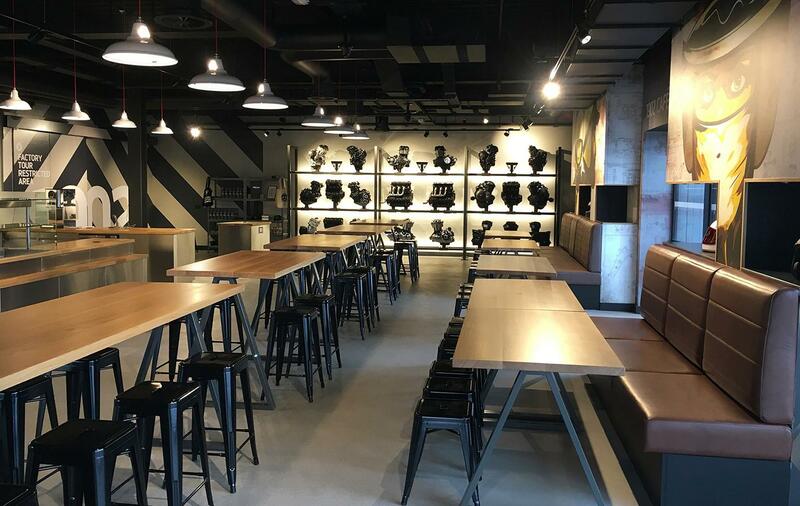 Although we hope that you won’t have any issues at all if you choose to invest in one of our tables, it’s important for you to know that we’ll take care of any that do arise. 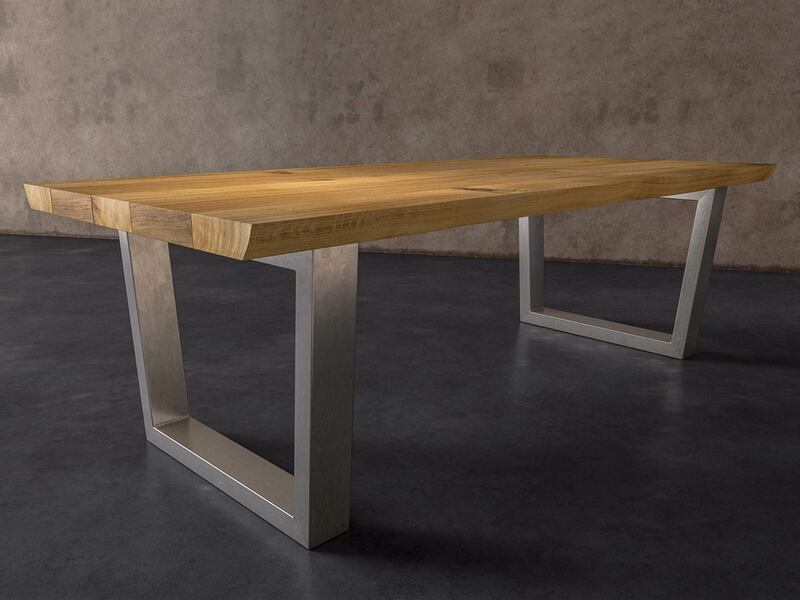 To create an industrial feel we’d recommend a table base made out of steel. You can choose either stainless steel, mild steel with a clear lacquer, or powder coated steel. 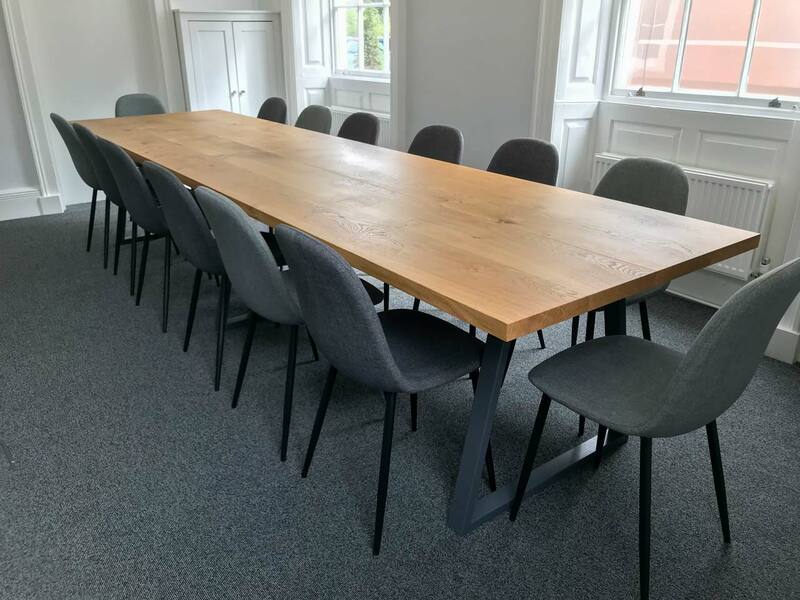 When paired with a rustic and characterful oak top, the combination works perfectly to create a stand-out industrial meeting table, industrial conference table, or industrial boardroom table. Specify any size and we’ll send over some concepts that. Below are some pictures of our Komodo Table. Click here to see more variations of this design.